To provide preschool-aged children with a developmentally appropriate and creative learning environment. Children will learn through experiences and hands on activities in both large and small group settings. They will also learn through play that is student led, as teachers interact and scaffold to promote higher-order thinking and creativity. We strive to guide them in interacting appropriately with other children and implementing conflict resolution skills. Aside from our educational objectives, it is our mission to teach the children about faith and love of Jesus Christ. 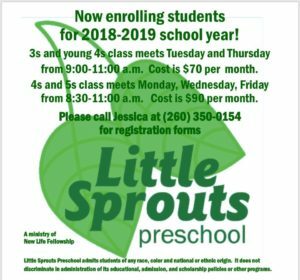 Little Sprouts Preschool admits students of any race, color, and national or ethnic origin.